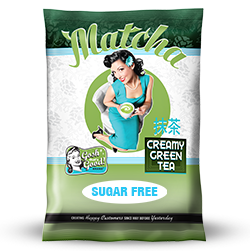 The same rich creamy premium green tea as our Original Green Tea Matcha™ but with less calories and carbohydrates. You will never know it's SUGAR FREE!! Maltodextrin, non-dairy creamer [coconut oil, maltodextrin, sodium caseinate (a milk derivative), mono-and diglycerides, dipotassium phosphate, silicon dioxide, soy lecithin], green tea powder, natural and artificial flavors, cellulose gum, tri calcium phosphate (anti-caking agent), salt, artificial color [contains FD&C yellow #6, yellow #5 & blue #1], sucralose.